The submarine eruption that started on December 1998 (BGVN 24:01 and 24:03) from multiple vents along the Serreta Volcanic Ridge, about 10 km W of Terceira Island, Azores, continued through March 2000. Vents along the ridge were very active between December 1998 and September 1999. Activity then declined to very low levels with rare surface manifestations through December 1999. Activity increased again in late January 2000. Several times during 1999 basaltic lava balloons were observed floating in the eruptive area. These "balloons" are very hot, gas-rich, lava fragments produced from small submarine lava lakes/fountains. During ascent to the surface, magmatic gas exsolves from the hot fragments, increasing the volume of the balloon while the crust is glassy and expansible. Once at the surface, interaction between the hot blocks and seawater produce white steam columns that can be seen from land when meteorological conditions are favorable (figure 5). The blocks eventually sink after the gas escapes. Figure 5. Lava balloon from the Serreta Ridge off Terciera floating on the sea surface and producing white steam column. Courtesy of CVUA. An oceanographic mission supported by the national Foundation for Science and Technology was carried out in April 1999 to study the geological/geophysical characteristics of the eruption and its impact on local ecosystems. Scientists from the University of Azores, University of Lisbon, University of Algarve, Instituto do Mar, and Instituito Hidrográfico used a remotely operated vehicle that crossed an impressive submarine volcanic plume just above an active eruptive center at about 380 m depth. This plume was formed by volcanic particles of ash and lapilli size along with gas bubbles and lava balloons up to 2 m in diameter. On 28 January 2000 a yellowish spot was observed at the sea surface above the eruptive area due to the dispersion of a volcanic plume that rose from a new vent located at about 250 m depth (figure 6). The area of water discoloration caused by the plume was visible almost continuously for about a month, reaching a maximum diameter of 8 km on 24 February. The plume was generated by multiple eruptive pulses from different eruptive centers located within a few hundred meters of each other. Figure 6. Aerial view of the edge of a submarine volcanic ash plume spreading at the sea surface. Courtesy of CVUA. Seismicity along the ridge related to the eruption continued through the end of March, but at low levels. Since the beginning of this volcanic crisis the physical and chemical parameters of waters and fumarolic gases from Terceira Island have been monitored, with no changes detected. Another submarine eruption took place in this general location in June 1867. At that time five months of strong seismicity destroyed about 200 houses at Serreta. Information Contacts: J.L. Gaspar, G. Queiroz, J.M. Pacheco, T. Ferreira, R. Coutinho, M.H. Almeida, and N. Wallenstein, Centre of Volcanology of the Azores University (CVUA), Departamento de Geociencias, Rua da Mae de Deus, 9502 Ponta Delgada, Azores, Portugal (URL: http://www.uac.pt/). The Global Volcanism Program has no Weekly Reports available for Terceira. A small seismic crisis during November 1998 was monitored by the Azores Seismological Surveillance System (SIVISA). It was centered W of Terceira Island on the E of the so-called Graciosa Trough [38.783°N, 27.483°W; submarine vent at -500 m]. After four days of major activity seismicity decreased and remained at normal levels until 18 December; then, a few microseisms were registered by SIVISA and white vapor columns were reported by fishermen to be rising from the sea 8 km W of Terceira island. These phenomena were discontinuous but persisted until the night of 23 December when local residents observed orange lights several miles W of Terceira. Although no unusual seismicity was noticed in the following interval, on 8 January fishermen again reported white vapor columns on the sea. Scientists from the Center of Volcanology of Azores University (CVUA) using a helicopter of the Portuguese Air Force took the first pictures of the phenomenon (figure 1). Lava blocks reaching a maximum of 3 m in length rose gently to the surface where they floated for a few minutes. White steam columns resulting from contact between hot lava blocks and seawater were observed, rising about 10 m above the surface of the sea. During the night the same activity was observed from the W coast of Terceira island and six different areas of incandescent, dispersed lava blocks were identified along a NE-SW axis. Activity continued at the same level until 13 January after which only intermittent short-period events were observed. Figure 1. Two views of the eruption site as photographed by João Gaspar from a helicopter during an overflight on 8 January 1999. Courtesy of CVUA. On the morning of 10 February three spots of white steam suddenly rose ~70 m into the air at a point 8 km from the coast. The steam was seen from land. That afternoon scientists from CVUA with personnel of the Azores Civil Protection Force retrieved the first rock sample from the eruption. Lava produced by this submarine fissure eruption was basaltic, showing phenocrysts of olivine, pyroxene, and plagioclase in a highly vesicular groundmass. Analysis of the sample suggested that material rose from the sea bottom as hot lava balloons, lost gas from their interiors at the surface, and then sank. Seismic activity and physical and chemical parameters of waters and fumarolic gases continue to be monitored. Another submarine eruption took place in this general location in June 1867, but closer to land. This is thought to be the first submarine eruption in the Atlantic in more than 30 years that has brought products to the sea surface. The name "Serrata" has been tentatively given to this feature. Information Contacts: João Luís Gaspar and Nicolau Wallenstein, Center of Volcanology of the Azores University (CVAU), Departamento de Geociencias, Rua da Mae de Deus, 9502 Ponta Delgada, Azores, Portugal (URL: http://www.uac.pt/). During February and March 1999 the submarine eruption that began late 1998 continued at the Serreta volcanic ridge, ~9-14 km W of Terceira island (BGVN 23:01; Luis and others, 1999). The activity decreased slightly until the end of February, but eruptive areas clearly defined two main volcanic trends in both NE-SW and NW-SE directions (figure 2). In March, activity became less vigorous and observers saw sea surface manifestations only during intermittent short periods. Figure 2. Location of bubbles and floating blocks at Serreta (Terceira) that vented in January (crosses), February (triangles), and March (open rectangle) 1999. The approximate locations of the 1867 eruptions are also shown (solid circles, taken from Machado, 1967). Courtesy of the Center of Volcanology of the Azores University (CVUA). The eruption of Serreta is interpreted as being a fissure-style vent that started along a NE-SW fracture system over 5 km long. During the eruption, the regional NW-SE fracture system also reactivated and eruptive vents developed on these two main trends. Plotting vent locations on published bathymetric maps made by the Instituto Hidrográfico puts them at depths of 300-800 m. However, bathymetric surveys carried out by the Portuguese Navy between January and March detected big anomalies in the area, perhaps due to gas bubbles, volcanic particles, and sharp thermal boundaries. Well-constrained depths for the active vents remain unknown and construction of a new bathymetric map of the area was planned for April. Floating blocks were seen on the surface (BGVN 23:01) and some were collected (figures 3 and 4). The scientific team attributed their seismic observations coupled with the floating blocks to the following mechanism. The magma, being low in viscosity, moves very easily through the already opened fractures and was thought to escape without producing high seismic signals. Floating lava blocks could result from the detachment of pillow-lava edges followed by the ascent of blocks with sufficient gas content. It is also possible that hot, gas-rich lava fragments result from small submarine lava lakes or fountains. A thin frozen skin of lava seals the gas cavity, and the block might then rise as a hot lava balloon. During ascent, the gas exsolves and nucleates inside the hot fragment while the blocks expand. Once at the surface the interaction between the hot blocks and the seawater produces white steam columns. At the same time, while cooling at the surface, the blocks crack slowly, lose their magmatic gas and sink. Sometimes when water enters inside the hot blocks, they blow up, violently throwing fragments several meters high. Figure 3. A floating lava block from Serreta (Terceira), 80 cm maximum diameter, collected on 10 February 1999. Such blocks have been termed a "lava balloons." Courtesy of the Center of Volcanology of the Azores University (CVUA). Figure 4. A sub-spherical floating block (a "lava balloon") from the Serreta eruption collected on an undisclosed day. Taken from Radiotelevisão Portuguesa (April 1999); URL: http://www.rtp.pt/. Another submarine eruption took place near the current one in mid-1867 (figure 1). Five months of strong seismicity around the time of the eruption destroyed about 200 houses on Terceira in the coastal settlement of Serreta. Websites associated with Azores civil defense and a local TV station have more photos of the eruption, including floating blocks. References. Azores civil defense website, April 1999, Açores crise sismovulcania: URL: <http://www.virtualazores.com/crise99/>. Luis, J.F., Lourenço, N., Miranda, J.M., Gaspar, J.L., and G. Queiroz, 1999, A submarine eruption W of Terceira Island (Azores Archipelao): InterRidge News, Initiative for international cooperation in ridge-crest studies, vol. 8, no. 1, Spring 1999, p. 13-14. Information Contacts: J.L.Gaspar, T.Ferreira, G.Queiroz, R.Coutinho, M.H.Almeida, N.Wallenstein, and J.M.Pacheco, Centre of Volcanology of the Azores University (CVUA), Departamento de Geociencias, Rua da Mae de Deus, 9502 Ponta Delgada, Azores, Portugal (URL: http://www.uac.pt/). Terceira Island contains four stratovolcanoes constructed along a prominent ESE-WNW-trending fissure zone that cuts across the island. Historically active Santa Barbara volcano at the western end of the island is truncated by two calderas. The youngest of these formed about 15,000 years ago. Comenditic lava domes fill and surround the caldera. Pico Alto lies north of the fissure zone in the north-central part of the island and contains a Pleistocene caldera largely filled by lava domes and lava flows. Guilherme Moniz caldera lies along the fissure zone immediately to the south, and 7-km-wide Cinquio Picos caldera at the SE end of the island is the largest in the Azores. Historical eruptions have occurred from Pico Alto, the fissure zone between Pico Alto and Santa Barbara, and from submarine vents west of Santa Barbara. Most Holocene eruptions have produced basaltic-to-rhyolitic lava flows from the fissure zone transecting the island. Calvert A T, Moore R B, McGeehin J P, Rodrigues da Silva A M, 2006. Volcanic history and 40Ar/39Ar and 14C geochronology of Terceira Island, Azores, Portugal. J. Volcanol. Geotherm. Res., 156: 103-115. Self S, 1976. The recent volcanology of Terceira, Azores. J Geol Soc London, 132: 645-666. Self S, 1978. (pers. comm.). Self S, Gunn B M, 1976. Petrology, volume and age relations of alkaline and saturated peralkaline volcanics from Terceira, Azores. Contr Mineral Petr, 54: 293-313. Zbyszewski G, Candido de Medeiros A, Veiga Ferreira O da, Torre de Assuncao C, 1971. Geologic map of Ilha Terceira (Azores). Servicos Geologicos Portugal, 1:50,000 scale map with 43 p text (in Portuguese). There is no Deformation History data available for Terceira. There is no Emissions History data available for Terceira. 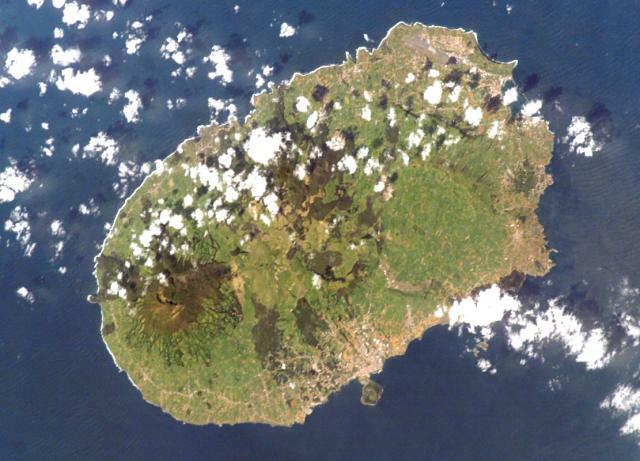 Terceira Island, seen here from the Space Shuttle, contains four stratovolcanoes constructed along a prominent ESE-WNW-trending fissure zone cutting across the island. The summit caldera of Santa Barbara, the westernmost volcano (and the only one active during historical time) is the dark-colored area at the left. Cinco Picos caldera can be faintly seen at the center, with the broad Guilherme Moniz caldera at the right. Historical eruptions have taken place from the rift zone and offshore vents. NASA Space Shuttle image ISS004-E-10890, 2002 (http://eol.jsc.nasa.gov/). 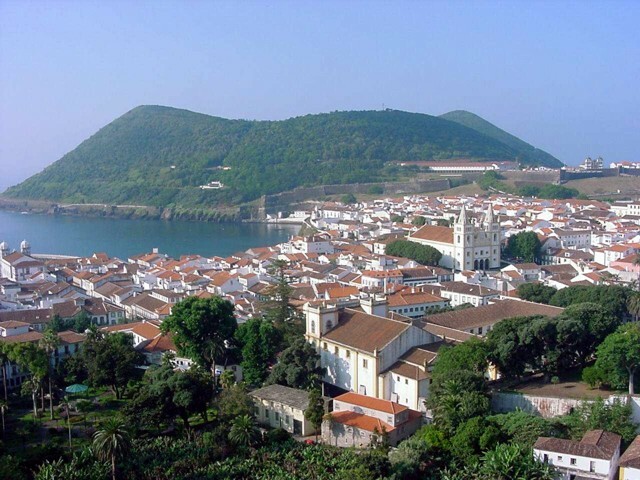 The Monte Brasil pyroclastic cone rises above the historic city of Angra do Heroísmo on the south-central coast of Terceira Island. Terceira contains four stratovolcanoes constructed along a prominent ESE-WNW-trending fissure zone that cuts across the island. Historically active Santa Barbara volcano at the western end of the island is truncated by two calderas. Historical eruptions at Terceira have occurred from Pico Alto, the fissure zone between Pico Alto and Santa Barbara, and from submarine vents west of Santa Barbara. Photo by Luís A. da Silveira, 2007 (Wikimedia Commons). The Global Volcanism Program has no maps available for Terceira. There are no samples for Terceira in the Smithsonian's NMNH Department of Mineral Sciences Rock and Ore collection. Large Eruptions of Terceira Information about large Quaternary eruptions (VEI >= 4) is cataloged in the Large Magnitude Explosive Volcanic Eruptions (LaMEVE) database of the Volcano Global Risk Identification and Analysis Project (VOGRIPA).